The crude animatation provided by you purporting to represent the building proposed under the current planning application does not show the building correctly and further shows three other buildings which are not existing or proposed. We assume that you have done that for humouristic and shock horror reasons, in the traditions of Monty Python. The graphic treatment of all further additional buildings are drawn in incorrect perspective and inappropriate weight. The existiing office building on the west side of Falcon Road would have been demolished had the station scheme progressed. In summary the piece is a travesty. Despite our previous requests that incorrect drawings and montages be removed from this site they have not been removed or corrected. Whilst you pay lip service to consultation you do not seem to be prepared to act responsibly, and seem intent to pursue your own agenda perhaps for other reasons. The applicant’s offer to meet you, after all the consultation that already took place whatever your protestations, has not be taken up. architecturerosemont>As I already replied (but maybe you did not read properly), it happens that I have job for living…. I know it might be a surprise, but I assure you that a lot of people do the same, and are not paid to write on this website. Therefore you might try to understand why my schedule is not extensive. However I will do my best and will let you know in due course. While the existing building on the proposed site, Mossbury House, is undistinguished, the plans submitted by Oak Trading Co cannot be countenanced. The site is within the Clapham Junction Conservation Area. What is the purpose of a Conservation Area if not, within reason, to maintain the existing attractive character of a locality? Clapham Junction town centre is all but exclusively characterised by low rise Victorian/Edwardian buildings, or by modern buildings which approximately conform to this template. There is not one building in the neighbourhood more than 5 storeys high. Even the slim landmark tower atop Debenhams (formerly Arding & Hobbs) rises no more than the equivalent of 6 storeys. The intended new hotel will, however, be 16 storeys. A new building of such height, no matter how “sensitive” its design features, colours, and textures, will drive a coach and horses through everything the Conservation Area seeks to sustain. At a stroke a modern skyscraper will be introduced to the heart of Clapham Junction which will overwhelm its surroundings, destroy the established, harmonious, and human-scale architectural identity of the area, and irreversibly transform its character. Does Wandsworth Council support the principles of a Conservation Area or does it not? This is the kind of self-serving tosh in which property developers specialise. No matter what form its superficial exterior details may take, the intended building is a tower block, pure and simple. Its gross looming bulk, and nothing else, will define its “setting within the Conservation Area”. This statement should be treated with the contempt it deserves. Furthermore, almost all the “artist’s illustrations” available have been cynically designed to disguise the proposed hotel’s obtrusiveness. They either employ a distorted fish-eye perspective or they outright exclude the top half of the building altogether. The result is a fraudulent representation of the proposed building’s size relative to its neighbours. The hotel will be more than three times the height of any other building, though it is all but impossible to tell from the pictures provided. These artist’s illustrations constitute a deliberate attempt to mislead the public. If there were some compelling economic argument in favour of such an inappropriate building, then it might be worthy of consideration. But there is not. The developers claim Clapham Junction “needs” a hotel. Why? An absence is not the same as a need. Creating a bogus “need” and then claiming to be able conveniently to meet it is the oldest trick in the marketeers book. How many letters has Wandsworth Council received from irate local residents or frustrated local businesses demanding a new hotel in Clapham Junction? The question answers itself. There are existing hotels at York Road and Smugglers Way, and a new hotel is soon to open at Falcon Wharf less than half a mile away. Anyone who suggests that visitors to a future “diplomatic quarter” at Nine Elms will be gagging to stay in Clapham Junction rather than 5 minutes over the river in central London is a fantasist. All the arguments about good transport connections are just as valid for an office building, or indeed flats, as for a hotel. While hotel guests obviously spend some money in local shops and restaurants, the projected creation here of a mere 30 full time jobs appears a meagre achievement for such a monster of a building. 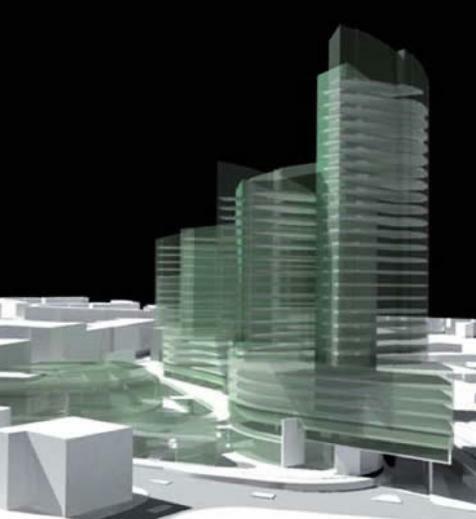 An office building of half the hotel’s proposed height could easily create double that number of jobs. The architect of this proposed hotel, David Rosemont, is on the record as saying that the building will make a “a direct, worthy, and early contribution to the regeneration of the town centre”. It’s funny, isn’t it, how it is always the architects and the property speculators who most enthusiastically fly the flag for “regeneration”, wherever it may be. But of course it’s this that keeps them in employment. While all the residents of Clapham Junction would assuredly like to see essential improvements to the station and better integration of train and bus, where is the evidence that they believe the rest of the town centre needs so-called regeneration? There is little wrong with any of the existing buildings. The town centre is already a thriving commercial enclave with shops, bars, restaurants, and other amenities very adequately meeting the needs of local people, who like the environment the way it is. It’s always the Rosemonts of this world, and rarely the residents of a place like Clapham Junction, who are so eager for “regeneration”, because it is potentially so profitable to them. And it is the word “early” in Rosemont’s quote above which really gives the game away. There cannot be the smallest shadow of a doubt that approval of a 16 storey skyscraper at Falcon Road will set an irresistible precedent for the building of further skyscrapers nearby. Indeed the developers have even, presumptuously, drawn attention to the wide open spaces of the adjacent Lidl/Boots/Asda site. The design of the proposed hotel is thus a textbook example of architectural entryism. If approved, the building’s glaringly anomalous height and bulk will kick down the doors of architectural restraint at Clapham Junction and pave the way for a transformation of the neighbourhood with other, assuredly even higher, tower blocks. The widespread public fury so recently expressed at the plans for two 42 storey skyscrapers on the station site make it only too plain what local residents think about high rise buildings being foisted upon a cohesive, well-balanced, and low rise locality like Clapham Junction. They don’t want them. One only has to glance across the railway tracks at the ugly mish-mash of tower blocks on the Winstanley Estate to see exactly what the town centre has so successfully managed to avoid in recent decades. Nobody has the remotest interest in a “landmark” building purporting to “add definition to the borough’s skyline” (in Councillor Edward Lister’s ridiculous words), least of all a dreary mid-market hotel of all things. The notion is laughable.  The economic arguments in favour of a hotel at Clapham Junction are unconvincing and the need for a hotel is unproven. Thanks Mr Hargreaves. I had seen your similar letter to the Council so I won’t comment in detail here. We will do a round up comment on all objections and submit that to the Council in due course. 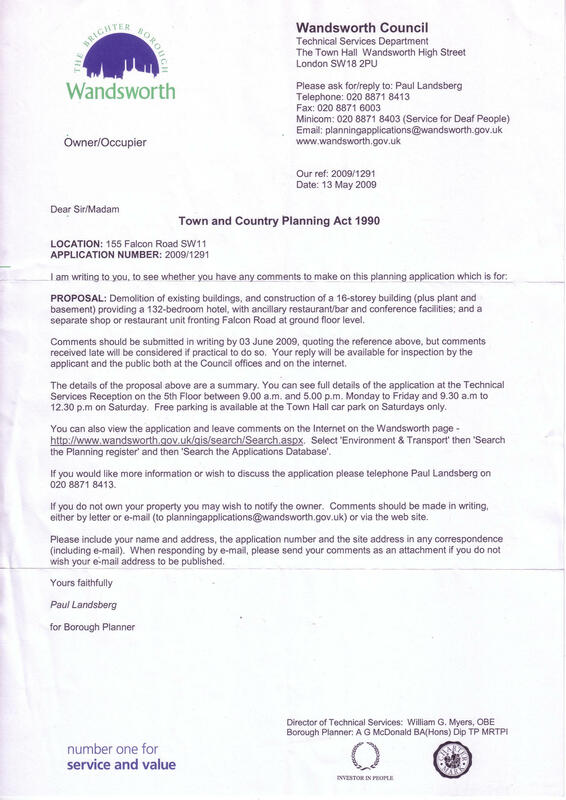 Obviously you have the right to make your comments regarding any planning application and we are happy with that. It’s just worth saying that the images we have provided are not as you say fraudulent and it’s not fitting that gratuitous insults are hurled about in what is meant to be a serious debate. It rather diminuishes the effectiveness of your arguments in fact. I think your specious statement that regeneration of Clapham Junction is not necessary rather puts you out on a limb when practically everybody else agrees it is. If cities do not attract the cycles of re-investment the logical conclusion is blight and decay, loss of jobs and all that goes with those. With respect we have seen that before, and in this area. All the experience of mature economies is that you have to move to stand still, at the very least. Actually, if you read the 700+ letters submitted to the Council in response to the Twin Towers application, you will find that virtually no-one thinks the area (as opposed to the station) needs regeneration, whilst everyone wants its existing character to be preserved. This does not make us some sort of architectural Luddites; rather it affirms our reasons for choosing to live here in the first place. I don’t think anyone could possibly mistake Cyril’s rather clever montage for anything other than an impression of what the area might look lke in the future. It therefore falls a long way short of the type of misrepresentation you appear to be claiming it is. I for one would be extremely happy to meet with you, and understand why you consider the area needs tower blocks to prevent its future descent into blight and decay. Like many people, I will take some convincing that past such experiments have not in fact caused this to happen. I don’t agree with your statement that nobody thinks that the area needs regeneration, and you certainly can’t get from the twin towers objections that conclusion either, however hard you try. That application was withdrawn after the developer apparently decided that the grounds of possible refusal, being transport, affordable housing and Section 106 contributions could not be agreed on in terms of viability, but the jury is out. It’s noticeable that while of course it would be for the elected committee to decide, the recommended grounds of refusal did not include the proposed height of the towers. It’s inconceivable that the general wish of the local community excludes regeneration of the town centre. Obviously you haven’t involved yourself in the work of or taken any interest in the Clapham Junction Town Centre Partnership over the years otherwise you would have been more familiar with the development of policy and strategy during the period. Many local groups are represented on the Partnership as well as businesses, councillors etc and the meetings are open to the public. It strikes me that much recent “objection” activity has been characterised by negativity and cynicism. You cannot build communities and improve your towns and cities and the aspirations of the people who live in them if you rely on those traits. Evidence of difficulties with local initiatives also drives away potential investors. Just look at the history of some other local London boroughs if you want to check that out. Yes many people come to live in the Borough because of its qualities, and it should also be mentioned its well run council, but the trolley is off the rails when you seem to imply that people come to live in the Borough because they like the existing architecture of the station approach, the station and Falcon Road, Falcon Lane and of course that other gem Asda. Have people’s hopes for the future really sunk so low? If they have that’s a sad indictment of the way things have become. I prefer to take a more positive view of the future. I assume that I’m not the only person to object to the patronising tone of Architecturerosemont latest posting. Well yes, I’m happy to disagree with several people on this forum in thinking that a little bit of regeneration would do Clapham Junction no harm. However, the idea that you cannot have regeneration without huge tower blocks (which no matter how far developers prefer to avoid the truth are anathema to the vast majority of local people, whatever their social class) is a cynical and blatant distortion of the truth. I take that to mean that local people should keep their mouths shut and be grateful for what their betters – developers, arcitects and planners – give them. Of course regeneration involves a number of architectural formats, although some contributors to this website seem to favour the pastiche. I admit to being an architect and welcome the debate. However your defintion of huge tower blocks seems inappropriate when our proposal is less tall than other existing and approved buildings in the area. It’s also 26 storeys shorter than the station scheme. Whatever you may argue I am afraid that regeneration simply does not happen without investment and to have investment you need investors. The council’s website on this application gives full details of the consultation that took place on this project before the application was made, in our submitted statement of community involvement. At the presentation to the Clapham Junction Town Centre Partnership that took place in November 2007 the scheme (which at that time was taller and bulkier) was broadly welcomed. Following the consulation and the public exhibition the scheme was reduced in height and slimmed down, apart from other enhancements. My experience in regeneration locally and elsewhere has confirmed the importance of consultation, and that is why it was undertaken in this case. Consultation does not however mean that absolutely everybody can agree on a project. The current debate continues and takes on board a huge variety of opinions. The process enables those to be expressed and, in due course, for the elected representatives to decide.